(Reuters) - Europe suffered a fourth day of losses as persistent worries about the pace of global growth and Brexit uncertainty took their toll on shares in the region. The pan-European STOXX 600 index closed 0.45 percent lower and is now nearly 3 percent lower than the six-month peak reached on March 19. 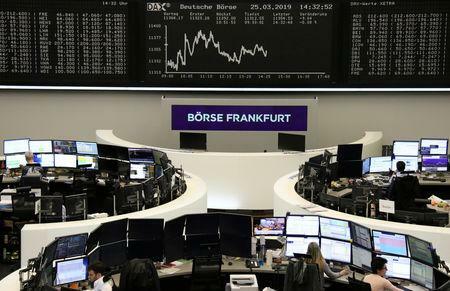 European stocks pulled back from an initial 0.8 percent fall after an unexpected rise in German business sentiment that eased fears of a recession in the European Union's largest economy. London's FTSE 100 led losses with a 0.42 percent fall, while the more domestically-exposed midcap FTSE 250 lost more than 1 percent to hit a six-week low, dragged down by uncertainty over Britain's EU exit. Germany, Paris and Madrid fell about 0.2 percent, while Milan lost 0.1 percent, although nearly all major indices were trading below 30-day average volumes. European stocks last week recorded their steepest drop for the year as weak manufacturing data from Europe and the United States exacerbated fears of a global slowdown. "Its a lingering fear of the state of the European economy," said David Madden, an analyst at CMC Markets. Among the biggest fallers on the pan-region index was Bayer, which was down 2.9 percent after the German pharmaceuticals group and Johnson & Johnson agreed to settle thousands of U.S. lawsuits against their blood thinner Xarelto for $775 million. Wood Group was the worst STOXX 600 performer, with a 7.6 percent drop, after Jefferies cut its rating on the oilfield and engineering services provider, citing dividend risks. Meanwhile, British satellite operator Inmarsat's shares rose by 9.6 percent, the biggest gainer on the STOXX 600, after a private equity-led consortium agreed to it for about $3.4 billion in cash. Media shares were the region's biggest losers, down 1.4 percent, with the tech sector 0.8 percent lower.